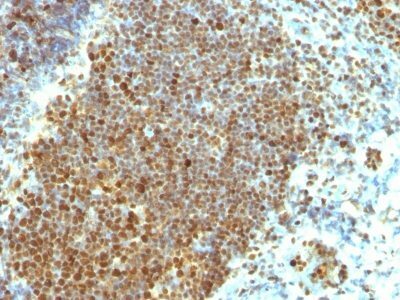 Recognizes a non-histone protein of 36 kDa, which is identified as proliferating cell nuclear antigen (PCNA). It is also known as cyclin or polymerase delta auxiliary protein. Elevated expression of PCNA/cyclin has been shown in the nucleus during late G1 phase immediately before the onset of DNA synthesis, becoming maximal during S-phase and declining during G2 and M phases. This MAb is excellent for multiple applications. 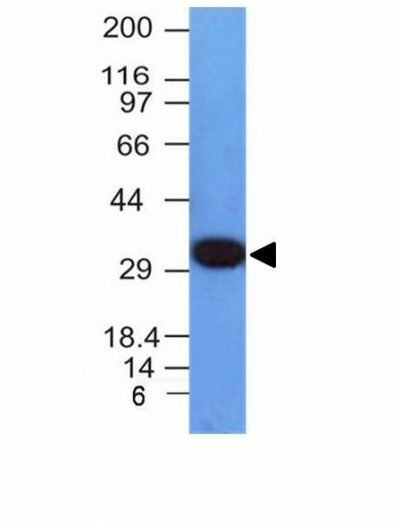 Catalog number key for antibody number 0694, Anti-PCNA (PCNA/694) The prefix indicates conjugation, followed by the antibody number and size suffix.